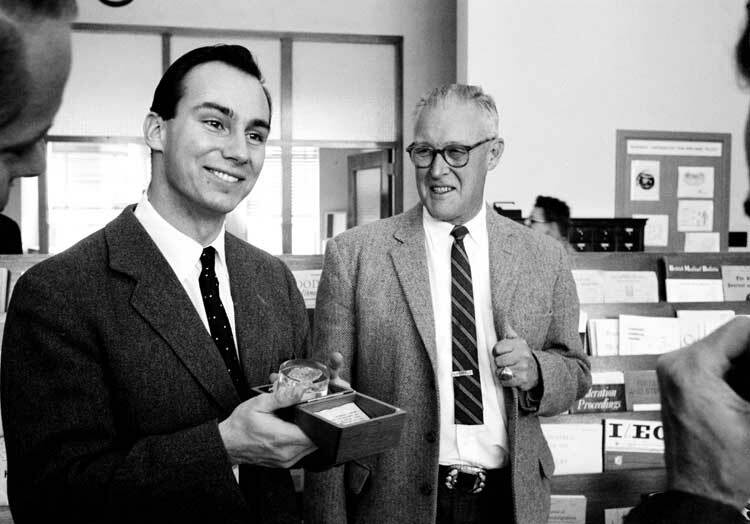 Friendly, smiling and interested in everything he saw, the Aga Khan impressed his scientific hosts on every phase of the medical research. 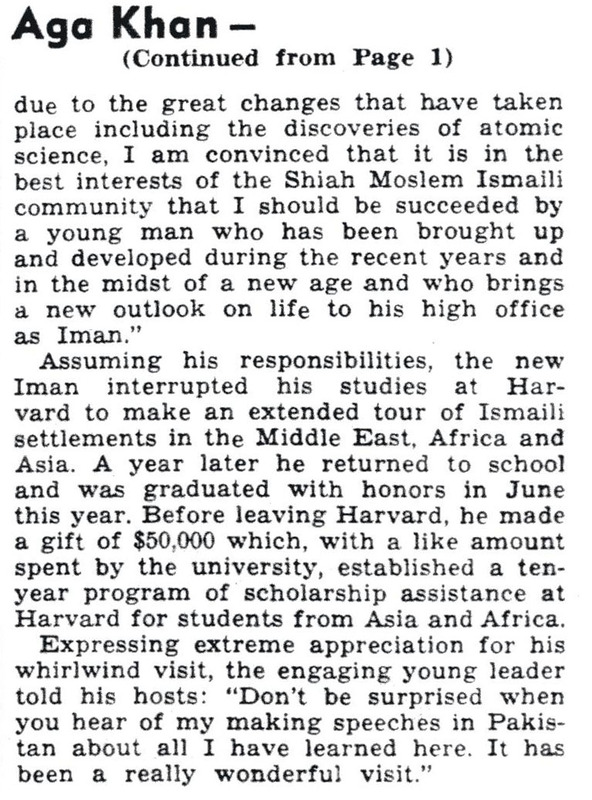 He manifested particular interest in the Laboratory’s work in tissue culture and its potential for cancer research, in the genetic effects of both radiation and inbreeding in mouse colonies, the use of radioactive isotopes in diagnostic medicine, and the possibilities of using whole body counters for studying the problems of aging. 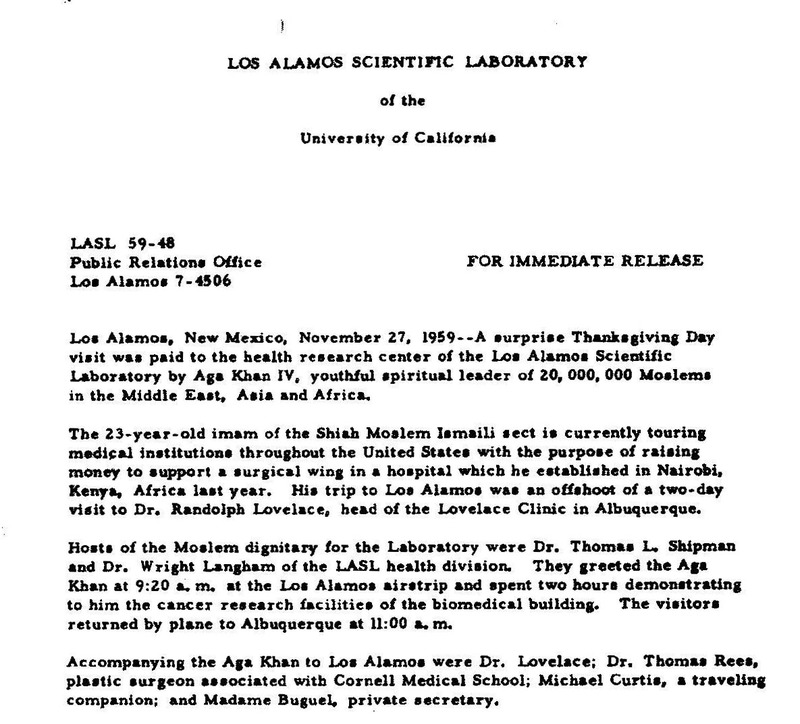 Los Alamo, New Mexico, November 27, 1959: A surprise Thanksgiving Day visit was paid to the health research center of the Los Alamos Scientific Laboratory (LASL) by Aga Khan IV, youthful spiritual leader of 20,000,000 Moslems in the Middle East, Asia and Africa. 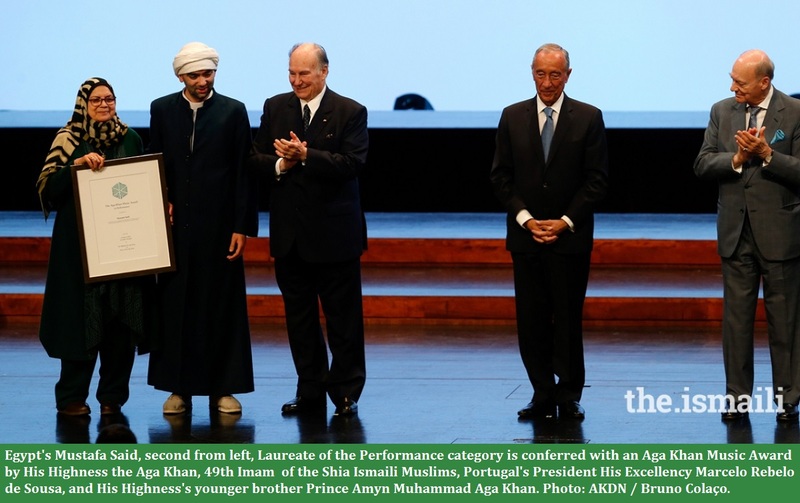 The 23-year-old Imam of the Shiah Moslem Ismalli sect is currently touring medical institutions throughout the United States with the purpose of raising money to support a surgical wing in a hospital which he established in Nairobi, Kenya, Africa last year. 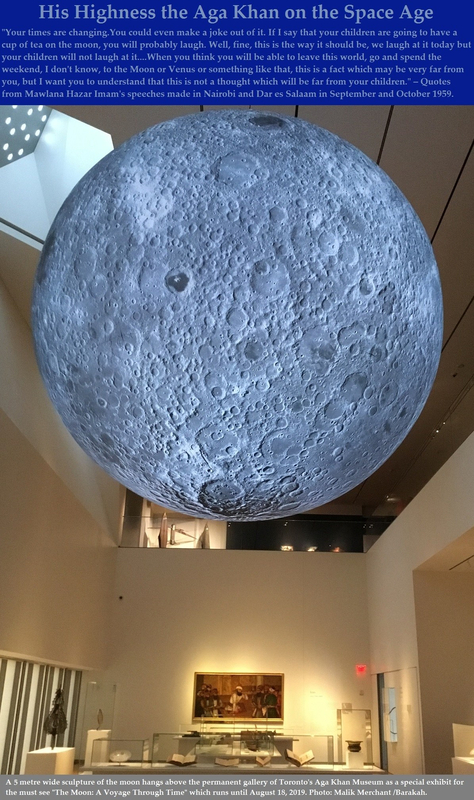 His trip to Los Alamos was an offshoot of a two-day visit to Dr. Randolph Lovelace, head of the Lovelace Clinic in Albuquerque. 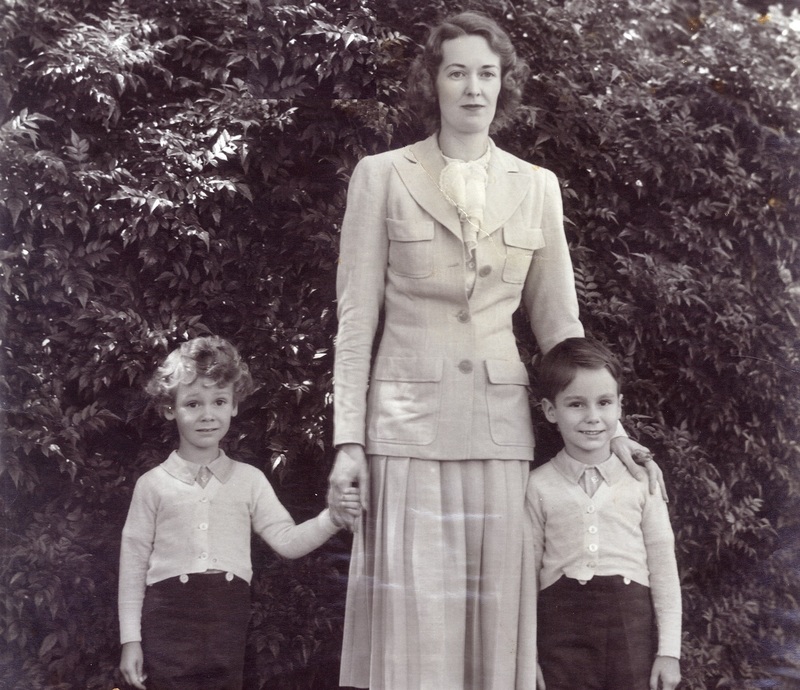 Accompanying the Aga Khan to Los Alamos were Dr. Lovelace; Dr. Thomas Rees, plastic surgeon associated with Cornell Medical School; Michael Curtis, a traveling companion; and Madame Buguel, private secretary. 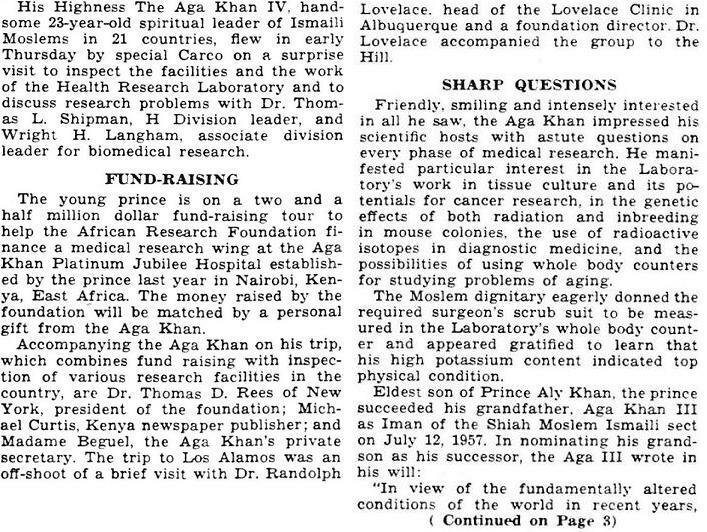 A report of the visit appeared in “NASL Community News” on December 3, 1959, Volume 1 Number 24, under the heading “YOUNG AGA KHAN TOURS HEALTH LAB ON SURPRISE THANKSGIVING VISIT.” See below for images of the report, and click each image on this page for enlargement. In a study conducted by American City Business Journals in 2004, Los Alamos County topped the list as the best place to live in America in terms of quality of life. 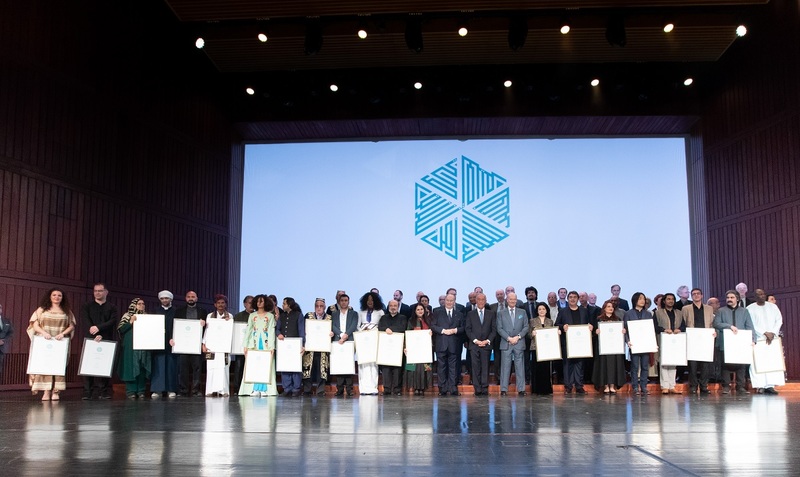 This was attributed to the high levels of job stability, income and education of Los Alamos residents, many of whom are employed as scientists and engineers at the Los Alamos National Laboratory. The county has one of the highest number of PhDs per capita and the median household income of $78,993 per year is the fourth highest among all the counties in the US. In per capita income, Los Alamos County ranks 1st in New Mexico and 18th in the United States. Other factors contributing to Los Alamos’s high quality-of-life index were the access to affordable housing and short commuting times.